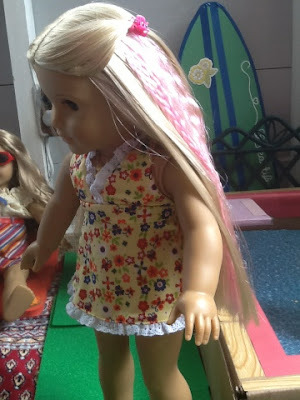 American Girl Doll Play: Make Colored Hair Extensions For Your Doll! 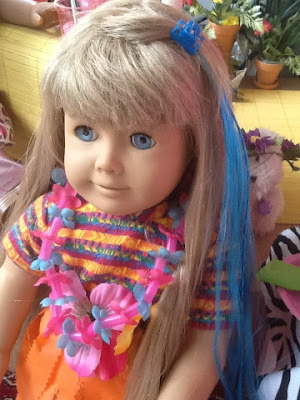 Make Colored Hair Extensions For Your Doll! Gracie has been perusing the American Girl Catalogue, and keeps showing me the colored hair extensions. I think they are cute, but wasn't sure how long they will be 'in style'. 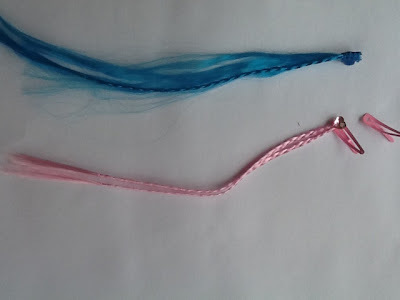 When I came across a package of left-over colored hair barrettes that were birthday favors I decided to try making them work for our dolls. I found these at Walmart in the party favor section. They were 4 barrettes for $1.00. The hair and gem were hot glued to the barrette. They easily pulled off. After removing the hair, I decided to un-braid one strand, and use a tiny doll sized hair clip that I found a 25 pack of at the Dollar Tree. 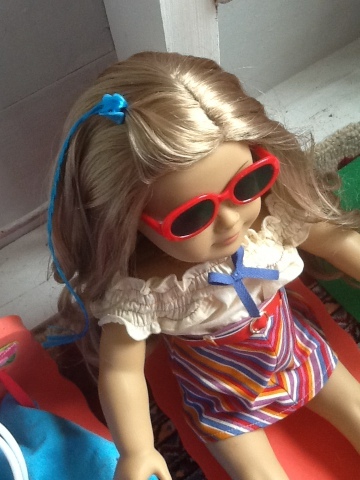 I did not want to put the metal barrette in the dolls hair and risk it getting tangled then damaging our dolls wigs. 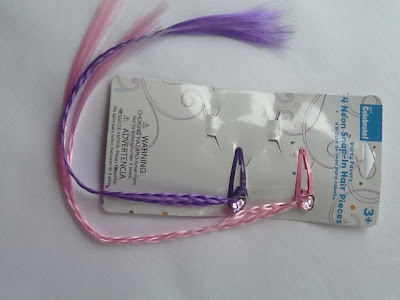 These little clips are just like the ones I have gotten from American Girl, they are very small, and have never gotten caught in our doll wigs. I am always careful to clip them into loose hair, not the wig cap. I did trim the end of the braid to make it the right length. I found that tucking the colored piece under the dolls hair gave made a cute do! 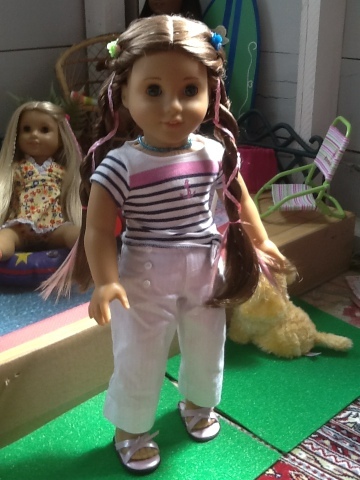 I left them in braids for dolls with curls. I took 2, left them braided and twisted around Marie Grace's braids for a different look! And, being that I spent less than $3 on 6-8 hair pieces, I had no problem cutting some short to fit Ivy! 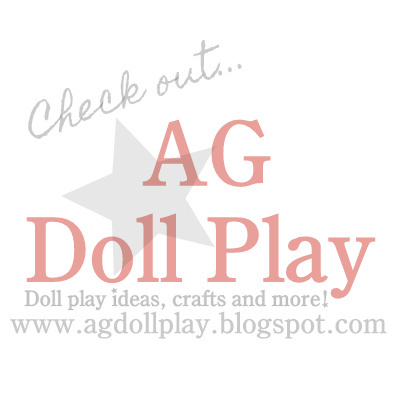 If you try making your own hair pieces for your dolls, be sure to share pictures with us on Facebook! Awesome idea for making your own colorful hair attachments. I will definitely be picking these hairpieces at Wal-Mart and the clips at Dollar Tree. You have made it so simple and affordable! I have actually been looking for these type of hair pieces since seeing them in the new AG catalog. I would never have thought about looking in the party supplies dept and changing the clip to make them safer for dolls and also more doll sized at the same time. That's a neat idea! I bought those before though, and they tangled and broke. But I didn't think of Undoing the braid. Hmm. 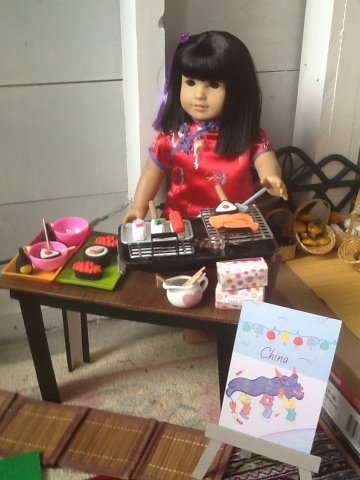 That's wonderful idea for my doll also. I will surely try it and i think if we want to look like a doll and just try hair extensions. Thanks for all the information. Your blog is too good.